Provide comfort for the family of Darlene Cook with a meaningful gesture of sympathy. Ohsontiio was born June 10, 1952 in Cornwall, Ontario the daughter of the late Francis Arquette and Rose Mary Cook. She attended schools on the reservation before going to Mater Dei and St. Lawrence College, where she graduated with a degree in criminal justice. Ohsontiio worked for Mohawk Council for 25 years in various positions helping people in the community. After her retirement, she started teaching Mohawk in Ganienkeh, where she worked for 2 years. She also started the first Language Nest and organized the first healing/talking circles for the community. 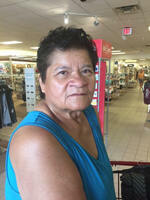 She was a member of the Mohawk Nation Longhouse and the Akwesasne Death Benefits Group. She took great pride in teaching the Mohawk language to the youth of the community. She enjoyed enjoyed listening to traditional music, shopping, traveling, gardening, and loved her animals. She is survived by her daughter, Alexandra “Sandi” Cook of Akwesasne; her granddaughter, Kariwiiostha Dupree; her step-father, Gene Marmon of Syracuse; her sister, Mary Arquette of Akwesasne; her brothers, David and Mary Arquette of Akwesasne; Craig Arquette of Akwesasne; Steve Arquette of Rochester, and John Arquette of Georgia; and many aunts, uncles, nieces, nephews, and cousins. She was predeceased by her mother, Rosemary Cook Marmon; her father, Francis Arquette; and her grandmother who raised her, Maryann Cook in 1991. To send flowers in memory of Darlene "Ohsontiio" Cook, please visit our Heartfelt Sympathies Store. Provide comfort for the family of Darlene "Ohsontiio" Cook by sending flowers. Dear Family, During this time of sorrow, may you find comfort in God's promise that he is near to those broken at heart and crushed in spirit. Psalm 34:18. May happy memories of Darlene Cook be with you always.